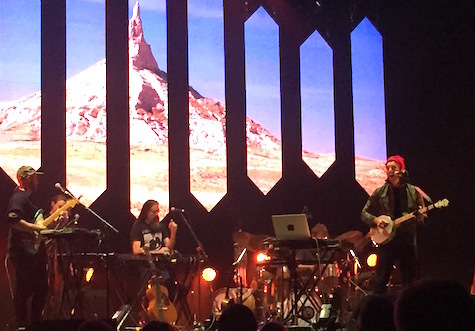 If you came to last night’s Sufjan Stevens concert at a nearly sold out Orpheum Theater and expected a career retrospective performance you probably left disappointed, but really, what did you expect? The guy is out supporting his new album Carrie & Lowell (Asthmatic Kitty, 2015). Did you really think he was going to play all your faves off the Illinoise and Michigan albums? C&L has been lauded as a career high-water mark for Stevens. It’s the third highest-rated album for 2015 in the Album of the Year composite list. Critics love it. I wanted to love it, but I’ve managed to work my way through the collection only a handful of times. It’s not so much that the theme — a survivor’s elegy to a dead mother and a prolonged meditation on the inevitability of death — is too depressing (a large share of Stevens’ catalog is mournful), it’s that the songs can be somewhat boring and lack the variety heard on earlier records. That said, Stevens managed to liven up the songs’ arrangements on stage for a concert almost solely dedicated to a dreary album. Nearly every song started with Stevens glowing in a single overhead spotlight while he sang in his trademark twee coo, meticulously picking out an intricate guitar line on an acoustic. Behind him, massive video screens in the shape of cathedral-style cut-outs showed serene landscapes or seascapes or Super 8-style home movie footage of him or his parents in happier times. The rest of the band, a talented four-piece on keyboards, strings, horns and percussion, slowly crept in by the second verse, eventually building each number to a full-on symphonic rage that came back to Stevens standing in that lone spotlight. Beautiful stuff, but as the person sitting next to me said, “Doesn’t he have any upbeat songs?” My whispered response: Wait until the encore. There were a few songs that broke the mold, including a blistering version of “Vesuvius” from The Age of Adz and a throbbing reinvention of “All of Me Wants All of You” from C&L that was a show highlight along the main set-closer — a 10-minute-long noise collage at the end of “Blue Bucket of Gold” that, when combined with a startling lighting effect, felt like swimming underwater during a hurricane. If there’s a quibble it was with the sound mix. There was too much delay in Stevens’ vocals during the first half of his set, leaving his usually clean, pristine-sounding lyrics indecipherable. They got it figured out by the end. After a standing ovation and a brief pause, Stevens came out for an encore that included older fan favorites like “Holland” off the Michigan album, which I haven’t seen on any of his other set lists, a version of “Concerning the UFO sightings Near Highland, Illinois,” a great take on one of my faves, “Casimir Pulaski Day,” and a stunning version of “Chicago” that left the crowd wanting more. The show started right at 7:30 with a half-hour set by Gallant, an LA-based R&B singer whose style wasn’t my thing, though he had a fantastic backing band (especially the guitarist, who blazed throughout the set). It was a strange choice for an opener, but I’ve come to expect odd parings when I see artists at The Orpheum. I guess it’s better than no opener at all, right?